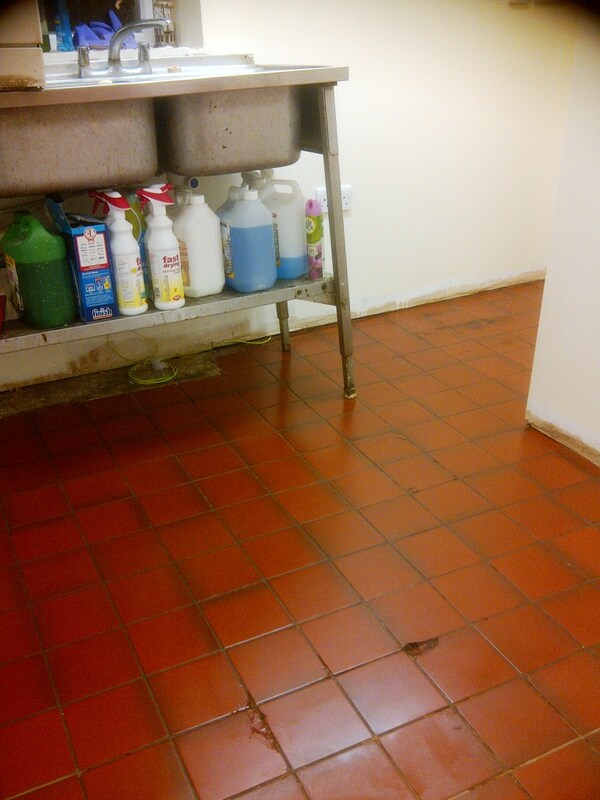 This job was to strip and re-seal these Quarry tiles installed in a commercial kitchen which was undergoing refurbishment at a canteen in Rushden, Northamptonshire. 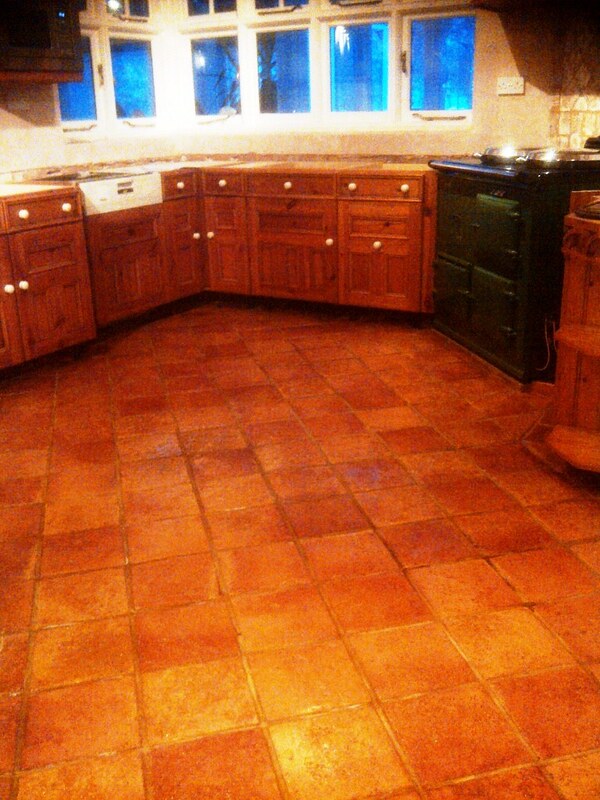 The tile finish had dulled and there was a lot of staining to the grout. 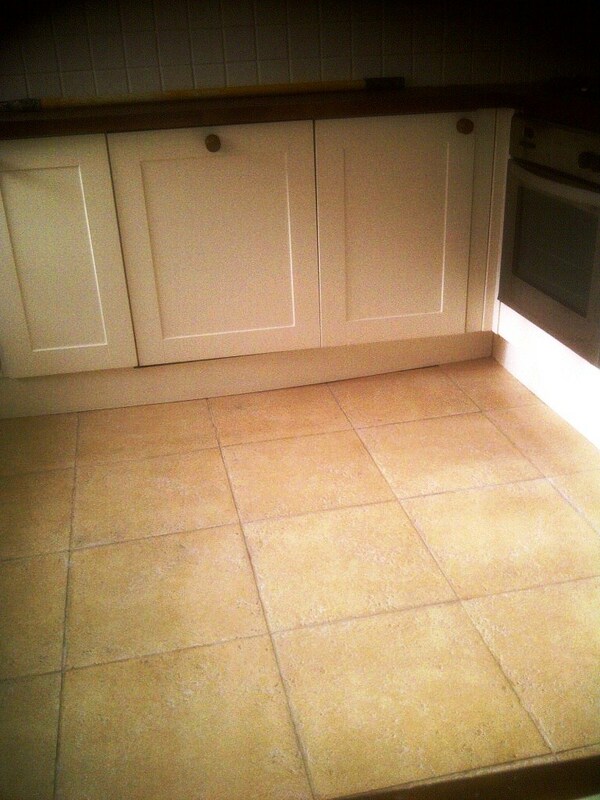 As there was little in the way of kitchen units to protect I go straight down to stripping down the floor using a strong dilution of Tile Doctor Pro-Clean which is a multi-purpose cleaner/stripper that’s safe to use on stone, tile and grout. 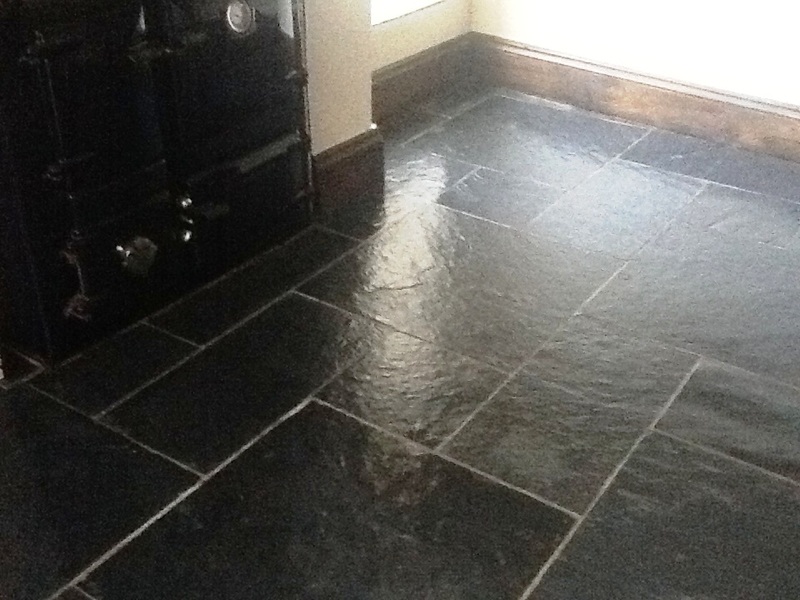 The solution was applied with a mop and left it to dwell on the floor for twenty minutes in order to give it chance to soak into the tile surface and get to work on the existing sealer and dirt. 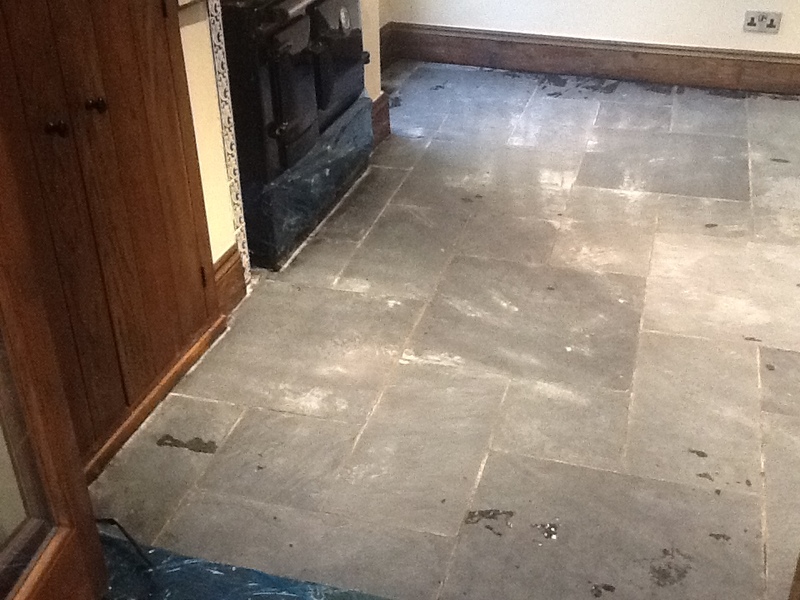 It was then worked into the floor using a rotary machine fitted with a black scrubbing pad and stiff hand brushes were used along the grout lines to get the grout clean. 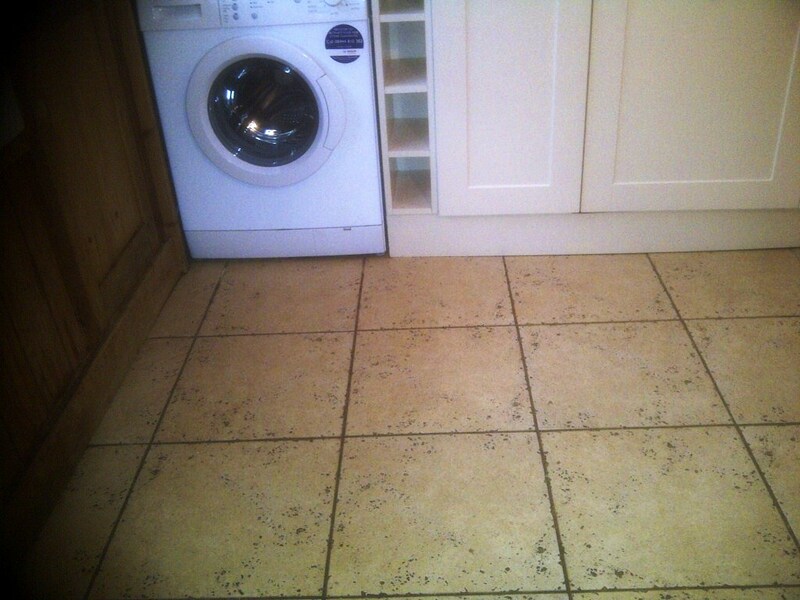 The resulting soiled solution was picked up with a wet and dry vacuum and the floor was then rinsed with clean water to neutralise the tile and stubborn areas re-treated. 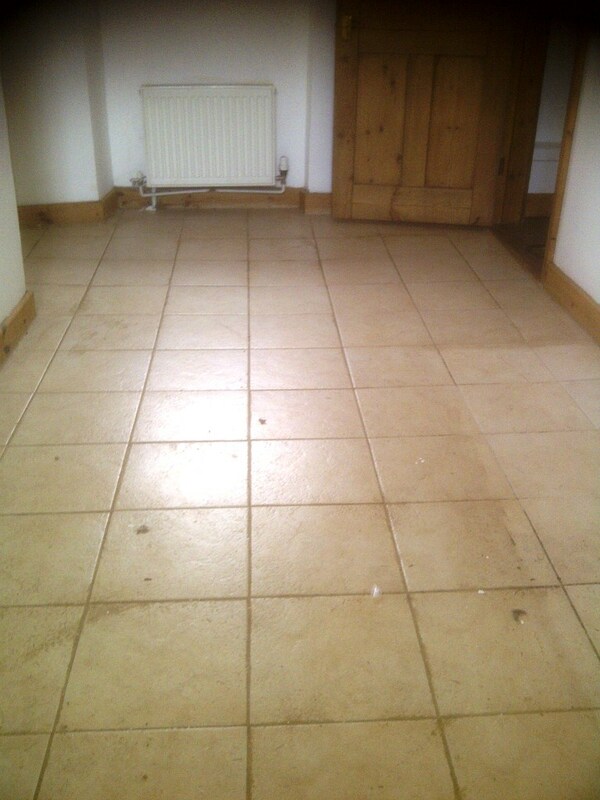 Once I was happy the floor was given a final rinse and then left to dry overnight ready for sealing the next day. 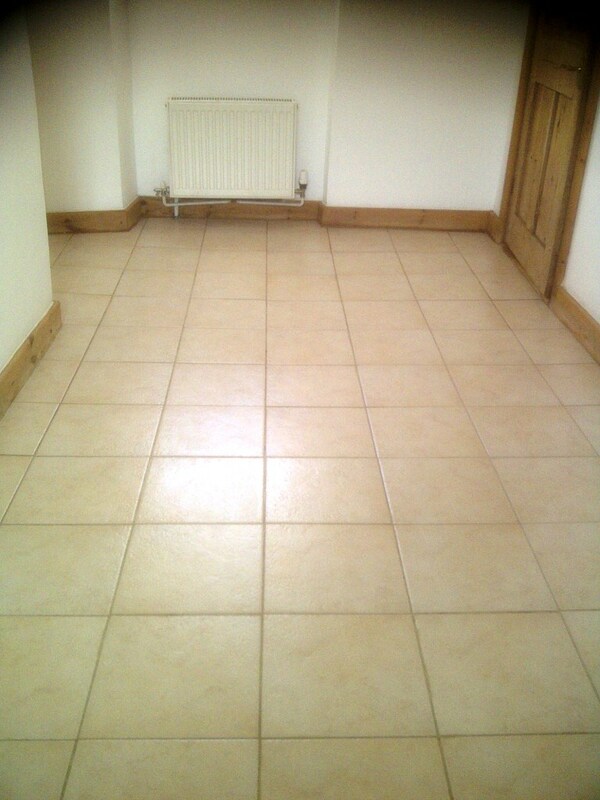 After checking the tiles had dried I proceeded to seal the floor using four coats of Tile Doctor Seal and Go which will protect the floor from staining going forward and also adds a nice shine to the tile. 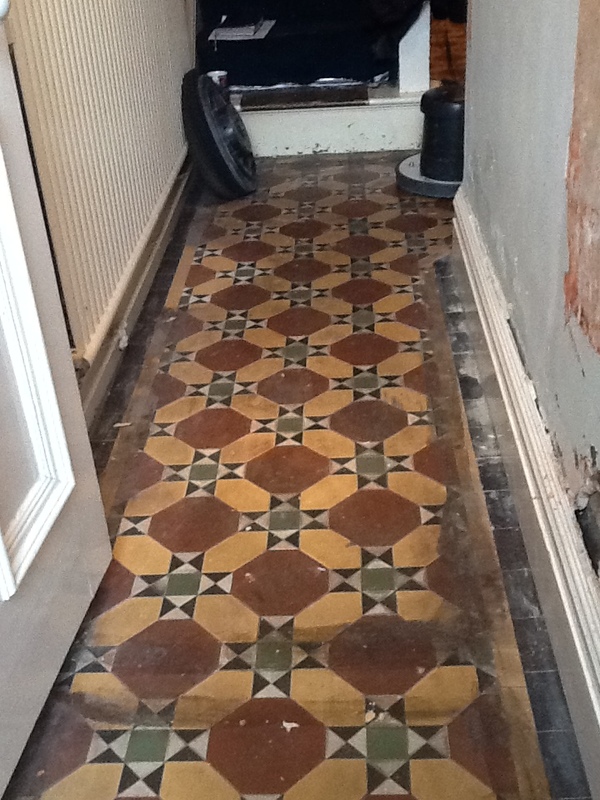 The following photos are from a Victorian tiled hallway floor at a residence in Kettering Northants which had been covered with carpet for the last thirty odd years; to make matters worse the carpet had been stuck down with adhesive which was proving very difficult to remove. 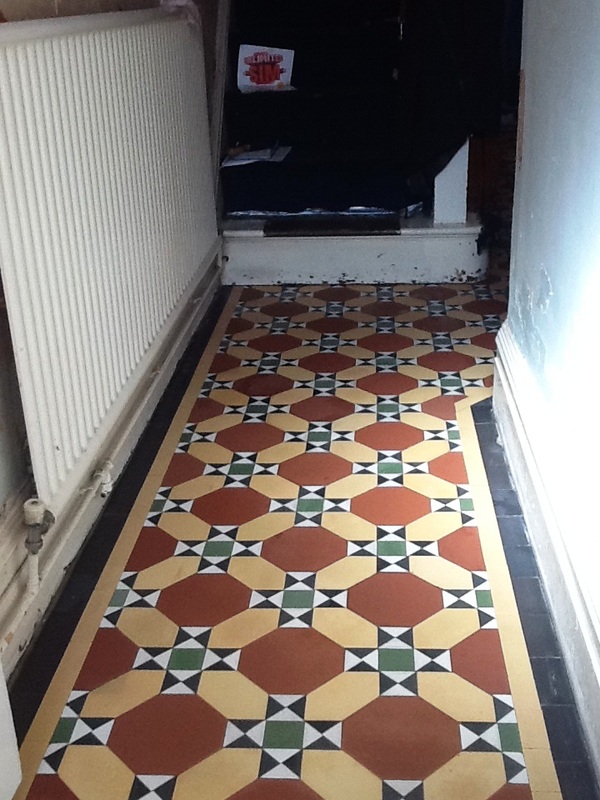 The customer phoned to see if it would be possible to restore the floor back to its former glory as it was very dirty and the colours were dull not to mention the glue. 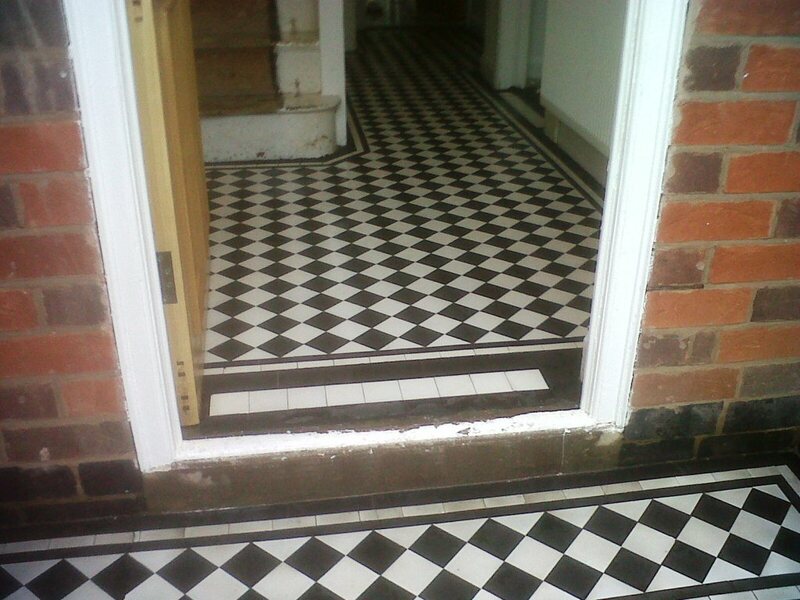 After a home visit and testing a small area to prove we could do the work, the customer booked us in to carry out the service before completing the decorating of the hallway. It’s always a good idea to have any heavy restoration work done before you decorate as heavy machinery is used and it can be a messy job. To remove the glue and restore the tiles Tile Doctor Remove and Go was left to soak into the tile before being brushed in with a rotary machine fitted with a black scrubbing pad. This process also works to lift out the embedded dirt from the floor tile; once done the soiled solution was removed using a wet vacuum and the floor rinsed with clean water to remove the product from the tile. To get the grout clean Tile Doctor Grout Clean-up was sprayed onto all the grout lines and then hand scrubbed in with stiff brushes; this was then followed by a second wash and rinse. 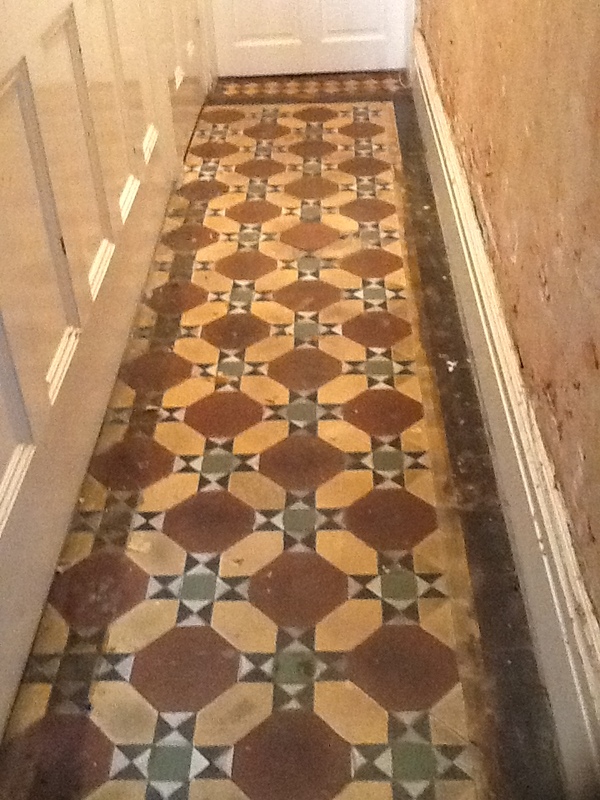 The hallway was still in general use so the floors were then sheeted up for three days to protect them whilst the floor tiles and grout were allowed to dry out assisted by a dehumidifier which we left on site. On our return we remove the sheeting and damp tested the tiles to make sure they had dried sufficiently; all was well so we sealed the floor by applying five coats of Tile Doctor High Shine as the customer had requested a high gloss finish in order to fully bring out the colours of the tiles. I think you will agree from the photographs we have managed to achieve this, certainly the customer was very happy with the results. 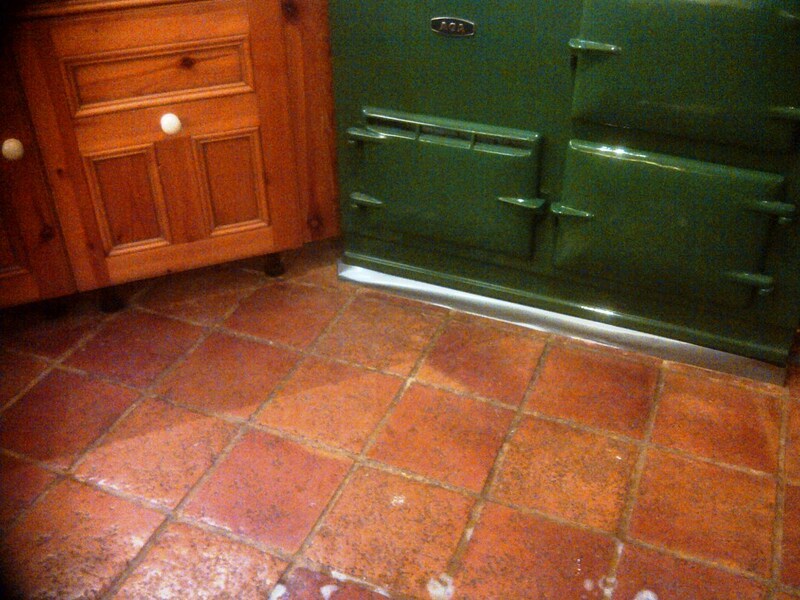 Apologies for the poor quality of these grainy Quarry Tile Cleaning photographs taken in the kitchen of a residential property in Daventry but it was the middle of winter and I was using my phone camera which doesn’t have an effective flash. 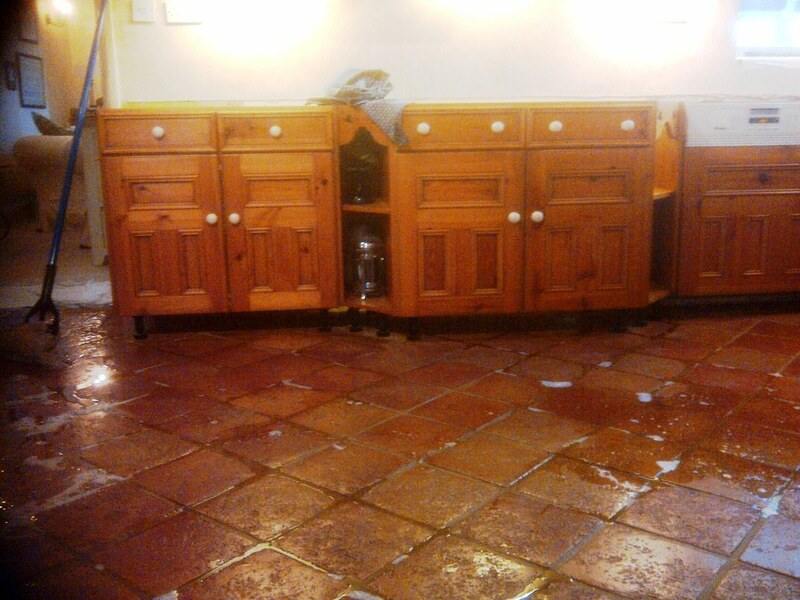 Hopefully you can see from the photograph below how dirt had become ingrained into the tile and stains to the grout. 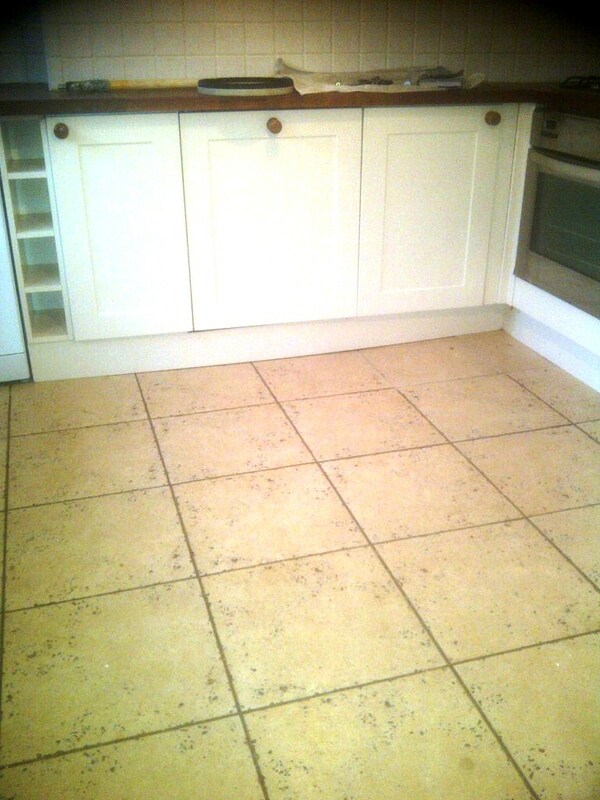 To get the floor clean I removed the kick boards around the base of the kitchen units and applied a dilution of Tile Doctor Pro-Clean mixed with NanoTech Ultraclean which adds tiny abrasive particles to an already powerful alkaline cleaning product that is safe to use on tile and stone. It was applied with a mop and left it to dwell on the floor for twenty minutes first in order to give it chance to soak into the tile and get to work on the dirt. It was then worked into the floor using a rotary machine fitted with a black scrubbing pad, stiff hand brushes were along the grout lines. 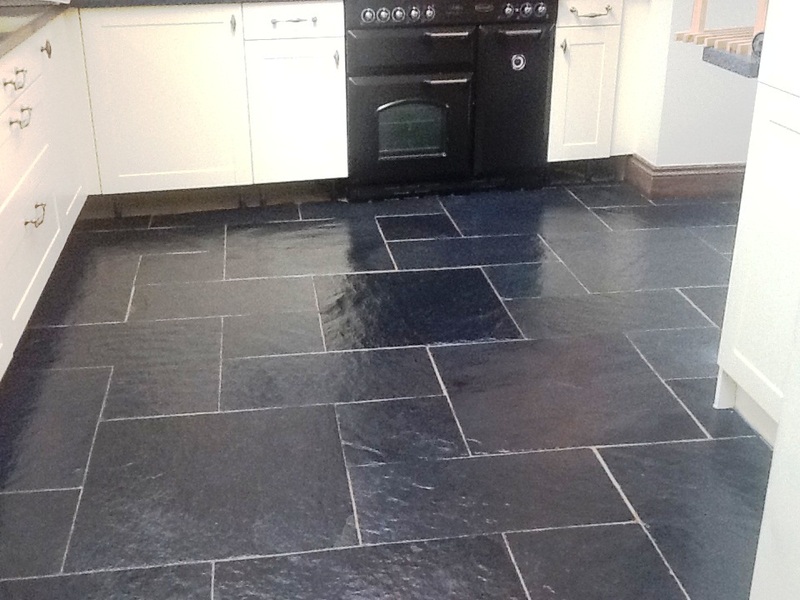 The soiled solution was picked up with a wet and dry vacuum and the floor was then rinsed with clean water to neutralise the tile and allow us to see which areas need further attention. 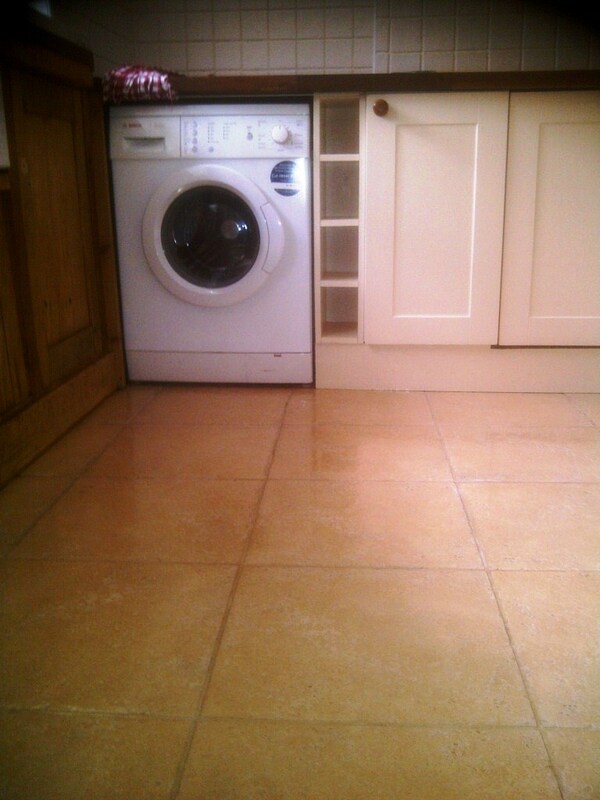 Once I was happy the floor was given a final rinse and then left to dry overnight ready for sealing the next day. On my return the floor was checked in a number of places with a damp meter to confirm it had dried which it had and it was then sealed using numerous coats of Tile Doctor Seal and Go which adds a nice shine to the floor as well as providing a surface seal that will help protect the tile from stains going forward. Sealing can take some time as you need to let the first coat dry before starting the second. 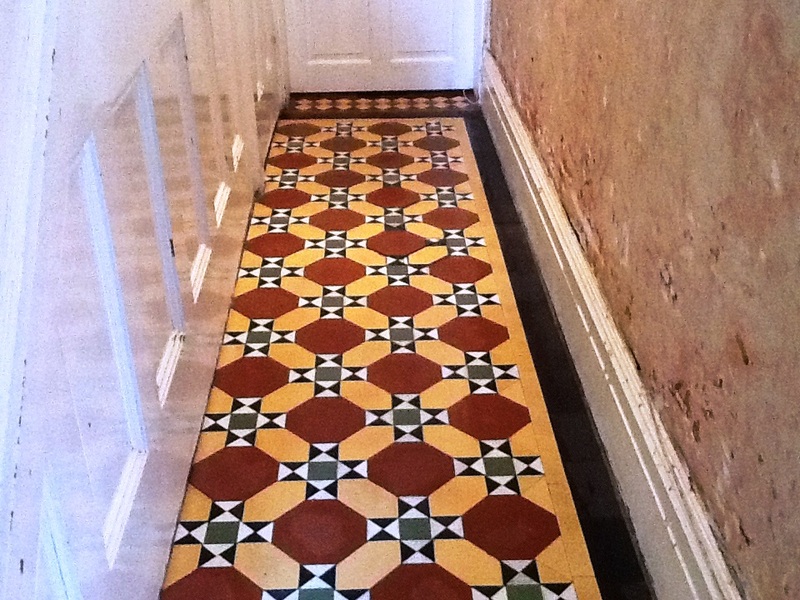 The photograph below is from a Victorian tiled hallway floor that we were asked to restore in the historic town of Towcester, Northamptonshire; the owner wanted the tiles restored as an original feature. 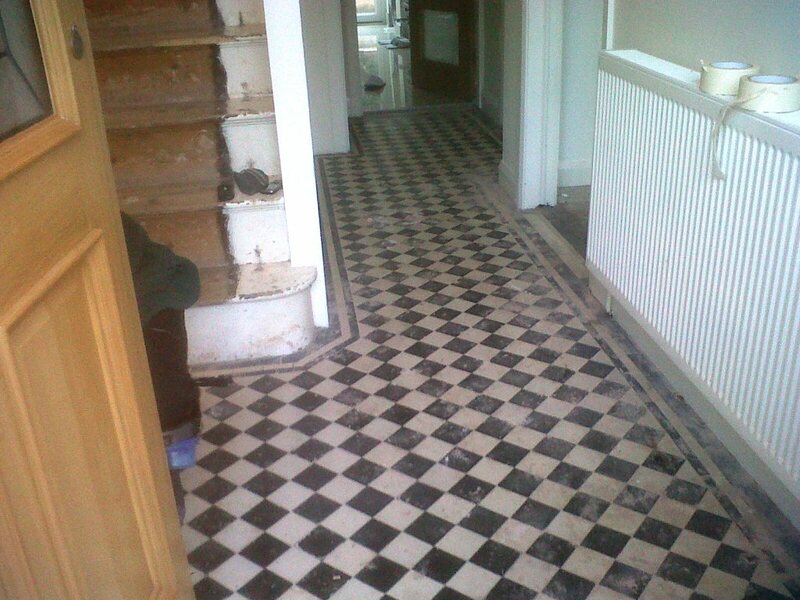 You can see from the photograph below how dull and neglected the tiles were so we had our work cut out. We set about cleaning the tile using Tile Doctor Pro-Clean which is a powerful alkaline cleaning product that is safe to use on tile and stone. It was applied with a mop and left it to dwell on the floor for ten minutes first in order to give it chance to soak into the tile and get to work on the dirt. 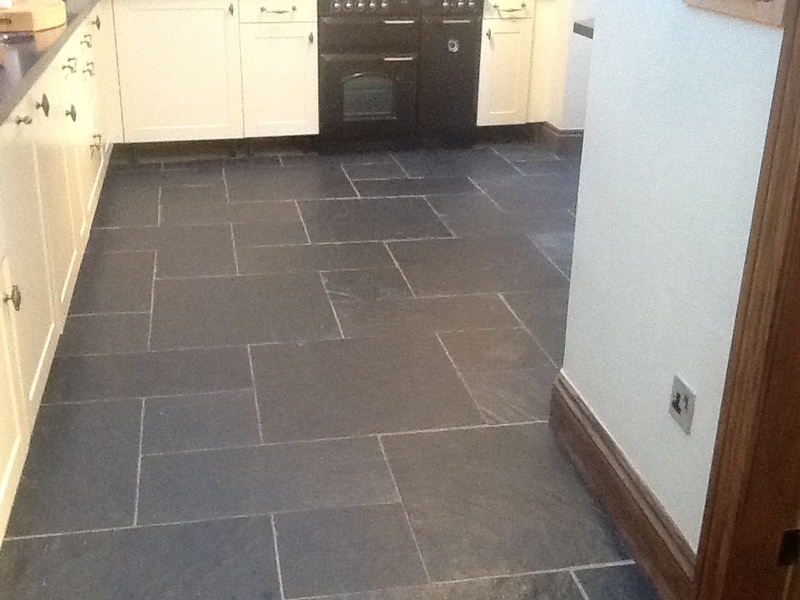 It was then worked into the floor using a rotary machine fitted with a black scrubbing pad, stiff hand brushes were used in difficult to get to places and along the grout lines requiring a substantial amount of elbow grease. The soiled water was picked up with a wet and dry vacuum and the floor was rinsed with clean water so we could see the result. 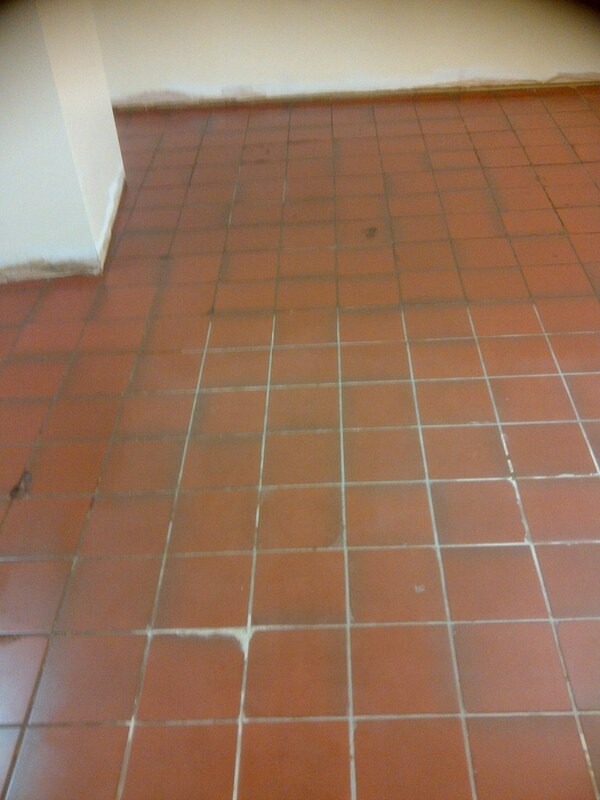 Unfortunately there were a number of stubborn areas and a stronger product was needed to shift them so we applied a dilution of Tile Doctor Remove and Go which is a coating remover that can shift most issues, again this was applied and left to dwell for a while before working it into the stubborn stains using hand brushes. The dirty solution was removed again using the wet and dry vacuum and we could see the tiles were now clean so the floor was given a thorough rinse several times with fresh water to remove any leftover chemical and then left to dry overnight. The next day the floor had dried so we were able to seal it using four coats of Tile Doctor Seal and Go which adds a nice shine to the floor as well as providing a surface seal that will help protect the tile from stains going forward. A lot of effort but what a transformation and well worth the work that went into it as you can see from the photograph above.